New to Office 365 in July—Microsoft 365, business apps and more | Com-Tech of Miami, Inc. New to Office 365 in July—Microsoft 365, business apps and more - Com-Tech of Miami, Inc. This month, we hosted more than 17,000 attendees at Microsoft Inspire, our annual conference for partners, where we announced Microsoft 365 and debuted three new business apps to help companies of all sizes empower their employees and unlock growth and innovation. We also introduced new features to help Office 365 subscribers create and connect more effectively. Read on for the details. At Microsoft Inspire in Washington D.C., we introduced a fundamental shift in how we will design, build and go to market to address our customers’ needs for a modern workplace. Introducing Microsoft 365—Satya Nadella unveiled Microsoft 365, which brings together Office 365, Windows 10 and Enterprise Mobility + Security to deliver a complete, intelligent and secure solution to empowers employees. To address the commercial needs from the largest enterprise to the smallest business, we introduced Microsoft 365 Enterprise and Microsoft 365 Business. Read our summary from Microsoft Inspire to learn more. 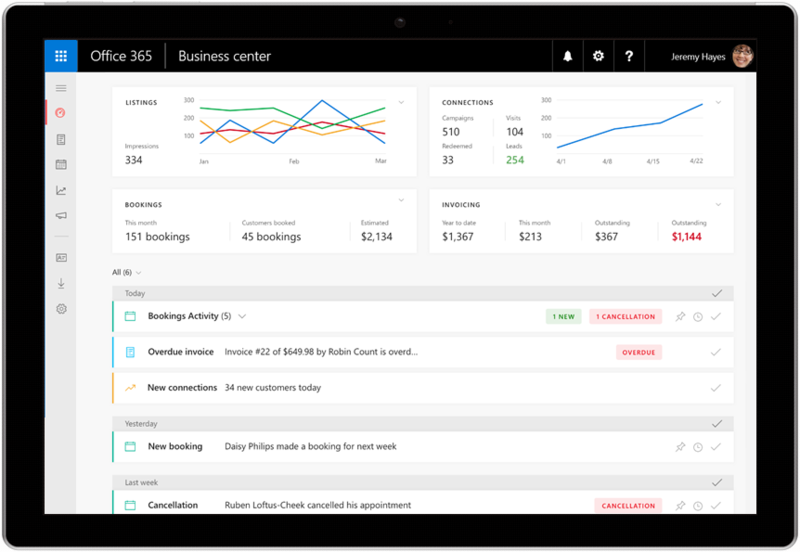 New business apps in Office 365 Business Premium—We also introduced the preview of three new apps in Office 365 Business Premium: Microsoft Connections, Microsoft Listings, and Microsoft Invoicing. These apps are designed to help you run and grow your small business, and are part of the new Office 365 Business center. MileIQ—the leading mileage tracking app—is also now included for Office 365 Business Premium subscribers. Read the announcement to learn more. The new Office 365 Business center is now included in Office 365 Business Premium. Availability: Connections, Listings, Invoicing and the Office 365 Business center are rolling out in preview to Office 365 Business Premium subscribers in the U.S., U.K. and Canada, starting with those in the First Release program. MileIQ Premium is available to all Business Premium subscribers in the U.S., U.K. and Canada effective today. This month’s Office 365 updates make it easier to create professional-looking presentations and to identify and correct errors while editing documents. Turn text into timelines in PowerPoint—Now PowerPoint Designer recognizes times, dates and topics on your slides and intelligently redesigns your content into professional-looking timelines, making it easier than ever to create high impact presentations. Start with a list of dates, then simply select Design Ideas in the Design tab and choose your favorite layout from the set of suggestions. Create a visual timeline in seconds with PowerPoint Designer. Availability: PowerPoint Designer support for timelines is available in English for U.S. customers in the Office Insider program in PowerPoint on Windows and Mac, PowerPoint Mobile on Windows and Android tablets, and PowerPoint Online. Support for 3D in Office apps—Starting this month, you can now add and edit 3D objects in Word, Excel and PowerPoint. Easily insert a 3D object from the Remix 3D catalog or your desktop, change its perspective and use transitions like Morph in PowerPoint to create cinematic animations between slides to bring 3D objects in your presentations to life. Easily insert 3D objects in PowerPoint from the Remix 3D catalog or your desktop. Availability: Support for 3D objects in Word, Excel and PowerPoint is available to Office Insiders on Windows desktops running the Creators Update and will reach general availability later this year. Read Aloud in Word—We continue to improve the Learning Tools available in Word and have moved Read Aloud to the Review tab. This latest update allows your document to be read back to you with simultaneous highlighting—from right within your workflow. This makes it easier to recognize and correct errors as you write, improving reading and editing accuracy for everyone, especially users with learning disabilities such as dyslexia. Read Aloud is now accessible from the Review tab. Availability: Read Aloud is now available in Word on Windows desktops for Office Insiders and will reach general availability later this year. Updates to Outlook and StaffHub make it easier for our Office 365 commercial customers to connect and manage tasks across their organizations. Outlook adds a smarter To: line and redesigned conversation view—Powered by intelligence from the Microsoft Graph, Outlook on the web and Windows desktop now offer improved contact suggestions and profile pictures when composing an email. This update makes it easier for you to find and communicate with the right people throughout your organization. Additionally, the redesigned conversation view in Outlook for iOS shows more of your discussion at once, allowing you to quickly review your message history and pick up right where you left off. The new conversation view in Outlook for iOS shows more of your conversation. Availability: Improved contact suggestions are available in Outlook on the web for all Office 365 commercial customers and in Outlook on Windows desktops for Office Insiders. The redesigned conversation view is now available for Office 365 commercial accounts (previously available for Outlook.com and Gmail accounts on iOS) and will be coming soon to Android. Enhancements to Microsoft StaffHub—Throughout July, we made several updates to Microsoft StaffHub, an Office 365 app designed to help Firstline Workers manage their workday. In industries like manufacturing, retail and healthcare, firstline workers often serve as the first point of contact between a company and its customers. Now team members can use the StaffHub app to assign, manage and complete tasks from co-workers and management, as well as access company-wide announcements—making it easier to keep everyone in sync. The new StaffHub task view, available on Android and iOS. Availability: Updates to StaffHub are available today by request and can be turned on for specific teams and customers.